In order for footballers to develop their skills properly, it is recommended that they start to learn the right skills at an early age. Attending football coaching gives children the opportunity to learn new skills and develop their talents in a constructive environment. 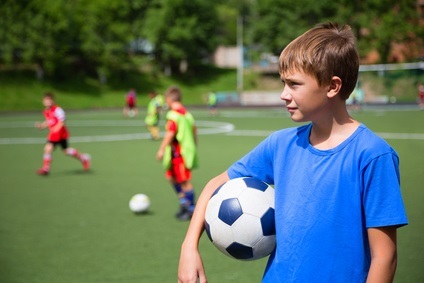 Being part of a youth sports team can also help children to develop important social skills. What is more, local talent scouts are normally aware of the best youth players in the area. some examples of skills drills which may be used in youth football coaching. Children are separated into groups of three, with one ball and three cones between them. The cones are arranged into a triangle formation and numbered from one to three. The children can also be given letters from A to C.
Player A and C should stand near to cone 1 whilst Player B should stand by cone 2. Player A most run with the ball between cone 1 and cone 3, keeping the ball at their right foot. They should take the ball around cone 3, and then pass the ball to Player B who is stood at cone 2. Player B should then dribble the ball with their right foot until they circle cone 3. They should then pass the ball to Player C who is stood by cone 1. As Player C is dribbling the ball between cone 1 and cone 3, Player A should run from cone 3 to cone 2. This will allow them to receive the ball from player C. When player A receives the ball back, they should begin the cycle again by dribbling the ball from cone 2 to cone 3 with their left foot. The cycle can be repeated as many times as required. This drill helps to improve ball control, dribbling and passing skills. When passing, it is important for people to be able to pass the ball with the right amount of power. Power drills help children to learn how much power to use when they are passing. All of the children stand in a line in a section of the pitch facing the halfway line. Every child has their own football. The children take turns to kick their ball so that it stops as close to the halfway line as possible. The child whose ball ends closest to the line gets a point. Several rounds of this game should be played with the line of children moving nearer and further away from the halfway line every time. This game helps children to learn how to judge distances and understand power when they are passing. Children are divided into groups of 6 and each group is given an equal sized section of the pitch to work in. Each group is then divided into two subgroups of three players. One team of three must try to pass the ball between each other whilst the other team of three tries to intercept the passes. Teams should keep track of how many passes they are able to make before they lose the ball. Tackling is not allowed in this game, so players must work on their interception skills. This game helps to build passing, moving and ball interception skills. 9 or more cones are set up in a V formation in front of a goal, with the apex being the furthest point from the goal. There should be about 1.5 metres between each cone. One player acts as the goalkeeper and the remaining players are split into two groups. One group is positioned at either end of the V shape. The first player from group one takes the ball and begins to dribble through the cones with the ball at their right foot. They should weave in and out until they reach the apex of the V-shape. They must take the ball around this cone and then shoot at the goal. After their shot they can run towards the back of group two. The first player from group 2 then mirrors the last player’s action, except that they dribble the ball with their left foot instead. The cycle should be repeated until every player has dribbled and taken a shot with both feet. This helps to improve dribbling and movement skills. It also gives players the opportunity to practice turning and shooting. In a penalty shoot off, players line up to take penalties. If a player scores they are allowed to run around to the back of the queue. If the player misses, they are knocked out. Players continue to take penalties until there is only one player left. This gives children a way to practice their penalty skills, as well as giving the keeper the opportunity to practice saving penalties. The coach will also get the opportunity to see who has the skills required for a real penalty shootout situation. To watch these training ideas in action check out the Coaching Manual on youtube. Previous Post:Should Footballers Take Supplements as Part of Their Diet?